This is a product for students of any age group, undergoing primary / Secondary / Graduate / Post Graduate education in either government or private or any other aided educational institutions. For this purpose, we have drastically reduced the minimum balance requirement to a nominal amount to encourage and inculcate savings habit among youth. The students can utilize this account for managing their pocket expenditure and maintenance of their scholarship amounts. 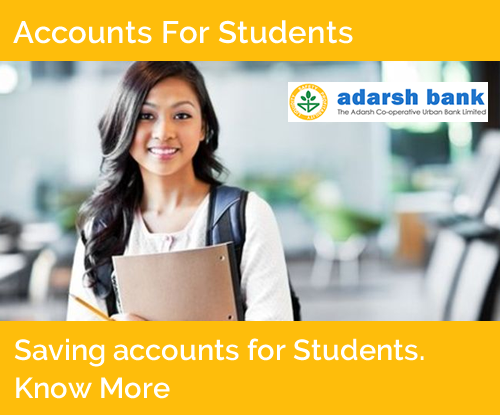 This account is provided purely to facilitate savings activity of students and should not be used for any other activities by the parent / guardian. Preference will be given in regard to sanction of educational loans on fulfilling the stipulated bank norms to those who have been maintaining student accounts with our Bank. Photo Identity Proof in the name of the applicant / Father or guardian. Residential Proof in the name of the applicant / Father or guardian. Student ID Card with photo and validity or Bonafide Certificate signed and issued by the Principal / Head of institution.